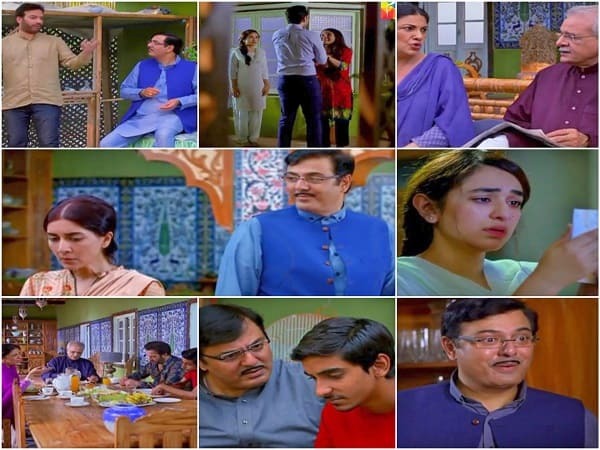 This was another episode of Dar Si Jati Hei Sila which showed the family dynamics in Noor Manzil in detail. There was a great deal of focus on Joi’s character just like the previous episodes. All of his scenes showed how cleverly he turned different situations in his favour. He exploited his sister because he knew she loved him and therefore would easily fall for the emotional blackmail. Joi also brainwashed Hathim and Sikandar because he understood the fact that they felt rejected by rest of the family members and were already disturbed. He constantly blackmailed and threatened Sadia because he knows Sikandar won’t think twice before divorcing her if he finds out she cheated on him and she will lose support of the family too. Joi is an evil person who is also really clever; this is a deadly combination which makes this character one of the most creepy and disturbing characters we have seen in recent times. Joi’s character is especially disturbing because he only shows his evil side to those people who he knows he can suppress and dominate. Otherwise, he has the image of a perfect harmless individual who has never even smoked a cigarette in his life! The opening scene of this episode yet again showed the difference between Sila and Zaini’s character. While Sila had a difficult time having a normal conversation with her own father, Zaini demanded something from him confidently and got exactly what she wanted. Sikandar was shown belittling his wife and daughter every chance he got. His attitude said a great deal about the reason for Sila and Sadia’s weak position in the house. It seemed like Sadia knew that Sikandar had a girlfriend or perhaps another wife abroad because she was really angry when someone sent Sikandar a message on his phone. Zaini’s dialogues on the breakfast table showed how the men in Noor Manzil got special treatment but Sikandar was constantly bullied by his bhabi who exercises much more power than her husband and all the men in the family combined together! My favorite scene from tonight’s episode was the one in which Sadia tells Sila to marry Raheel because he was her ticket out of this house. Even though Sila knew Raheel did not love her, she tried to have a “normal” conversation with him – something which was a huge deal for her! Zaini’s entry however changed everything and served as a reality check. This was the first time that Sila spoke her mind but was forced into staying quiet yet again. Sila’s relationship with her brother was heart-warming and their conversations meaningful. Every time Sila tries to think for herself she is forced to follow orders therefore she no longer has an opinion about anything at all. This episode ended on an interesting note and even though the pace of this drama is slow, so far it has been directed brilliantly and some of the actors especially are performing superbly. Nauman Ijaz is beyond amazing as Joi, Yumna Zaidi’s character is extremely challenging since she has hardly any dialogues but her portrayal is powerful, Saman Ansari continues to impress in another different role and Sakina Samo has nailed her character. The biggest weakness of this drama so far is that the viewers still don’t know a lot about Sila’s character and she doesn’t have enough dialogues. Even though it is easy to understand why she has such a weak personality but even then it would have been easier to relate to what she is going through if we knew more about what she has been through in the past. I am sure that these details will be revealed gradually but the curiosity is killing me! Also, some of the scenes and scenarios are repetitive already.